Fans Toys FT-16 Sovereign, Planet X PX-09 Mors and PX-10 Jupiter NOW INSTOCK!!! Transformers Legends Soundwave, Brainstorm, and Convobat NOW INSTOCK!!! LG38: Convoy Supreme, Maketoys Downbeat, Voltron Legendary Defender figures pre-orders open! New Transformers Legends are coming! eHobby Exclusive: Magna Convoy - Autobot warrior comes with dual guns and sword! Pre-order at AJ's Toy Chest! LG41: Legends Leo Prime - Paying homage to the great Lio Convoy; Leo Prime comes equipped with sword, dual blasters and comes with his very own headmaster! LG42: Legends Godbomber - Combines with Legends Super Ginrai to to form the powerful God Ginrai! MP36: Masterpiece Megatron - The Emperor of Destruction is coming! Masterpiece Megatron is here to lead your other Masterpiece Decepticons into battle! MP37: Masterpiece Artfire - This Masterpiece Autobot Targetmaster is here to put out fires and Decepticons alike! MP38: Masterpiece Convoy (Supreme Commander Version) - Masterpiece Convoy as he was depicted in toy form and the OVA "Lio Convoy in Imminent Danger!!" You can never keep a good Decepticon down and 7 of their best are back! Add them to you collection today! MP11: Masterpiece Starscream Reissue - The devious Decepticon Second-in-Command comes with pack with his coronation crown and cape! MP13: Masterpiece Soundwave with Laserbeak Reissue - The evil Decepticon Communication Commander returns with his trusted accomplice Laserbeak to spy on the Autobots! MP15: Masterpiece Rumble and Jaguar Reissue - Add to your collection today! MP16: Masterpiece Frenzy and Buzzsaw Reissue - Add to your collection today! Electronic Black Lion - The Black Lion, piloted by Shiro, leads the other lions into battle! When Shiro gives out the command to form Voltron the evil Galra turn tail and run! Set of 4 Deluxe Lions - Keith, Hunk, Pidge, and Lance come with their awesome robotic lions fully equipped to stop the evil Galra Empire! LG37: Legends Condor with Apeface - Condor transforms from data pad to deadly bird, to tank and back! Comes with Headmaster! LG38: Legends Jaguar with Bullhorn - Jaguar transforms from data pad to terrifying panther to plane and back! Comes with Headmaster! LG39: Legends Brainstorm - The final member of the original four Autobot Headmasters is here! Add to your collection today! LG40: Legends Astrotrain - Blast off into adventure with this Triple Changing Decepticon in Anime Colors! Follow AJ's Toy Chest on Facebook! Follow AJ's Toy Chest on Twitter! LG41: Legends Leo Prime - Paying homage to the great Lio Convoy; Leo Prime comes equipped with sword, dual blasters and comes with his very own headmaster! ARRIVING NEXT WEEK! Voyager Wave 03 - Optimus Prime - ARRIVING NEXT WEEK! Voyager Wave 03 - Megatron - ARRIVING NEXT WEEK! LIONS, AND CHEETAS, AND CRANES, OH MY! LG41 Leo Prime, MP34 Cheetor, and MP 35 Grapple NOW INSTOCK!!! Titans Return Voyager Optimus Prime and Megatron arriving this week!!! LG41: Legends Leo Prime - Paying homage to the great Lio Convoy; Leo Prime comes equipped with sword, dual blasters and comes with his very own headmaster! NOW INSTOCK!!! MP34: Masterpiece Cheetor - NOW INSTOCK!!! MP35: Masterpiece Grapple - NOW INSTOCK!!! Titans Return Voyager Wave 03, Titan Master Wave 04, Masterpiece Cheetor, Masterpiece Grapple, Legends Leo Prime, Now Instock! Come check out our new webstore redesign! SPRING SALE! Titans Return Voyager Wave 03, Titan Master Wave 04, Masterpiece Cheetor, Masterpiece Grapple, Legends Leo Prime, Now Instock! Spring is sprung! Save 10% off your entire order when you enter SPRING2017 before checkout. Don't forget to check out our sale section as well! Offer not valid on Pre-Order Items. Limit one coupon per customer. SPRING SALE CONTINUES! Titans Return Voyager Wave Broadside Pre-Orders Open, Titan Master Wave 04, Masterpiece Cheetor, Masterpiece Grapple, Titans Return Voyager Optimus and Megatron, Now Instock! Check back this weekend for the start of our Black Friday Sales! Our Black Friday/Cyber Week Sale has been extended through 12/08! Transformers: Power of the Primes Deluxe Figures Arrive Saturday! Don't miss out on adding these great figures to your collection! Deluxe Power of the Primes Restock, New Transformers Legends, Power Baser Pre-Order & More! As 2017 comes to a close we want to thank all of our customers for making our second year in business a great one! Check out our Sale page for some great end of the year savings! LG55: Targetmaster Slugslinger - Coming Soon!!! LG56: Perceptor & Ramhorn - Coming Soon!!! LG57: Octane - Coming Soon!!! MP-10B: Black Convoy (Reissue) - Coming Soon!!! MP-39: Sunstreaker - Coming Soon!!! Fans Hobby MB-06: Power Baser - Now Instock!!! Voyager Grimlock - Now Instock!!! Deluxe Autobot Jazz - Now Instock!!! 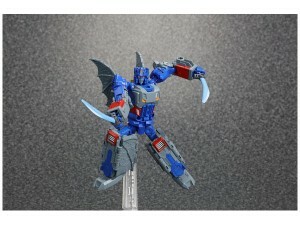 Deluxe Dinobot Swoop - Now Instock!!! Deluxe Dinobot Slug - Now Instock!!! Deluxe Dreadwind - Now Instock!!! LG50: Sixshot - Now Instock!!! LG51: Targetmaster Doublecross - Now Instock!!! LG52: Targetmaster Misfire - Now Instock!!! LG53: Broadside - Now Instock!!! MP-12+: Sideswipe/Lambor (Anime Colors) - Now Instock!!! Legends Slugslinger, Octane, and Perceptor Now Instock! Masterpiece Black Convoy and Sunstreaker Now Instock! Power Baser Now Instock! Perfect Effect Mega Dragon Pre-Order Open! LG55: Targetmaster Slugslinger - Now Instock!!! LG56: Perceptor & Ramhorn - Now Instock!!! LG57: Octane - Now Instock!!! MP-10B: Black Convoy (Reissue) - Now Instock!!! MP-39: Sunstreaker - Now Instock!!! New Legends Figures Now Instock! Power of the Primes Restock! New Third Party Pre-Orders open! Power of the Primes Leader Class Restock! Gcreation Rebel, Zeta Toys Fly Fire Now Instock! New Transformers Legends coming next week! LG58: Autobot Clone Set - COMING NEXT WEEK! LG59: Blitzwing - COMING NEXT WEEK! LG60: Overlord - COMING NEXT WEEK! JUST ARRIVED: Power of the Primes Voyager Wave 02, Legends Wave 02, Prime Masters Wave 02, GCreation Rebel, Iron Factory War Giant and more!!! JUST ARRIVED: Power of the Primes Deluxe Wave 02, Legends Wave 02, New Transformers Legends, Fans Toys Sovereign and more!!! AJ's Toy Chest News! Transformers Legends Feature Products, Transformers Masterpiece, Power of the Primes Leader Restock, Fans Toys Sovereign, Gcreation Rebel AND MORE! LG63: G2 MEGATRON - ORDER NOW! LG62: TARGETMASTER WINDBLADE - ORDER NOW! LG61: DECEPTICON CLONE SET - ORDER NOW! LG60: OVERLORD - ORDER NOW! LG59: BLITZWING - ORDER NOW! LG58: AUTOBOT CLONE SET - ORDER NOW! LG57: OCTANE - ORDER NOW! LG53: BROADSIDE - ORDER NOW! LG56: PERCEPTOR - ORDER NOW! LG50: SIXSHOT - ORDER NOW! LEADER CLASS RODIMUS UNICRONUS - PRE-ORDER HERE! LEADER CLASS OPTIMUS PRIME - ORDER NOW! LEADER CLASS RODIMUS PRIME - ORDER NOW! GCreation GDW-02: Rebel - ORDER NOW! War Giant IF EX-24: Commander Cannon Chariot - ORDER NOW! Fans Toys FT-16: Sovereign - ORDER NOW! AJ's Toy Chest News! Studio Series Deluxe Wave 01 ARRIVING NEXT WEEK! New Studio Series Leader Class figures, New Transformers Legends, and more! STUDIO SERIES - 01 DELUXE BUMBLEBEE - ARRIVING NEXT WEEK! STUDIO SERIES - 02 DELUXE STINGER - ARRIVING NEXT WEEK! STUDIO SERIES - 03 DELUXE CROWBAR - ARRIVING NEXT WEEK! STUDIO SERIES - 04 DELUXE RATCHET - ARRIVING NEXT WEEK! TRANSFORMERS LEGENDS - LG64: SEASPRAY & LIONE - NOW INSTOCK!!! TRANSFORMERS LEGENDS - LG65: TARGETMASTER TWIN TWIST - NOW INSTOCK!!! TRANSFORMERS LEGENDS - LG66: TARGETMASTER TOPSPIN - NOW INSTOCK!!! AJ's Toy Chest News! Studio Series Deluxe Wave 01 NOW INSTOCK! Last Knight Deluxe Figure Sale! New Studio Series Leader Class figures, New Transformers Legends, and more! STUDIO SERIES - 01 DELUXE BUMBLEBEE – NOW INSTOCK!!! STUDIO SERIES - 02 DELUXE STINGER - NOW INSTOCK!!! STUDIO SERIES - 03 DELUXE CROWBAR - NOW INSTOCK!!! STUDIO SERIES - 04 DELUXE RATCHET - NOW INSTOCK!!! TRANSFORMERS: THE LAST KNIGHT - DELUXE FIGURE SALE!